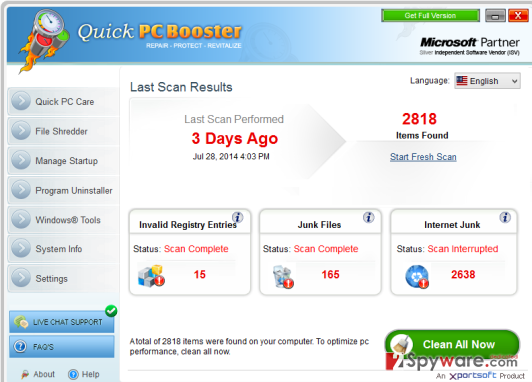 Xportsoft Quick PC Booster is the PUP that uses misleading techniques to prevent removal. Use Reimage to locate malicious components and get rid of them faster than with uninstall instructions. A full system scan blocks virus reappearance and prevents traffic to malicious domains. What is Xportsoft Quick PC Booster? How can Xportsoft Quick PC Booster hijack my computer? How to remove Xportsoft Quick PC Booster virus? Xportsoft Quick PC Booster is a very questionable application that promises to enhance PC’s performance by removing old and useless registries, as well as fix system errors. Although that sounds great and people install such and similar optimization tools on a daily basis, you should better make a research on Xportsoft Quick PC Booster before installing it. You will probably find lots of reports from reputable security vendors that this program is not trustful and is even considered to be a rogue and potentially unwanted program (PUP). It’s important to mention that Xportsoft Quick PC Booster virus may show up on your computer without downloading it there. It’s infiltration may be followed by various inconveniences, the most prominent of which is continuous system scans and irritating alerts. Once installed this questionable optimization tool may modify various system settings and install a scheduled task, which allows initiating a full system scan for bad registries from time to time. Besides, you may continuously informed about various system errors and may be offered to buy a ‘full version’ of Quick PC Booster by Xportsoft. However, you should be aware that this dubious program is set to display predetermined scan results, which are probably the same in all computers. This way, developers of this app seek to scare people and trick them into spending their money for a useless program. We DO NOT recommend buying Xportsoft Quick PC Booster license since you may not only lose your money for a questionable program, but may also disclose credit card details for online scammers. In order to prevent identity theft, system slowdowns, and similar issues, we highly recommend you to remove Xportsoft Quick PC Booster virus using a reputable anti-spyware, such as Reimage. 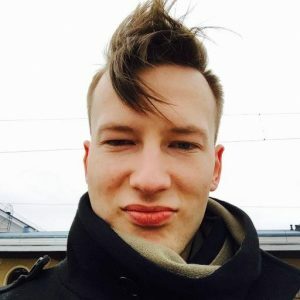 In most of the cases, Xportsoft Quick PC Booster infiltrates target computer without asking for user’s permission directly. It may do that using ‘bundling’, which means that is may spread around as an ‘optional download’ along with various freewares and sharewares. For preventing such infiltration, you should be very cautious when installing free programs on your computer. Do not accelerate the installation. Check everything step-by-step and NEVER click the ‘next’ button if you are not hundred percent sure with what terms do you agree. Besides, if possible, always select Advanced or Custom installation option because this way all additional components will be disclosed for you and you will be able to unmark them. If Xportsoft Quick PC Booster infiltrates the system, you may consider it to be a useful program, except it’s not. It can slow down your machine and may continuously initiate system scans and irritating alerts. Choose ‘Xportsoft Quick PC Booster ‘ and select the ‘Uninstall/Change’ option. Click OK when it says that Xportsoft Quick PC Booster was successfully removed from your computer’. This entry was posted on 2015-03-27 at 06:20 and is filed under System tools, Viruses. You can quickly scan the QR code with your mobile device and have Xportsoft Quick PC Booster manual removal instructions right in your pocket. How did you remove Xportsoft Quick PC Booster?